“November seventh is Camus’s feast day,” says Sister Helen Prejean, with impish irony, giving the agnostic French author a ring of sainthood. “He taught us that Christians should get away from abstractions and confront the blood stained face of history—that we should speak out clearly,” says Prejean, who credits Camus’s essay “Reflections on the Guillotine,” as a major influence during her work on Dead Man Walking. Camus won the 1957 Nobel Prize for Literature at age 44. He died in an automobile accident in France in 1960, not yet 47. Several of his works prompted anticipation of the author’s imminent conversion. His untimely death did nothing to silence the rumors that he had been secretly receiving instruction in the Catholic faith. All this was ironic tribute to a man whose philosophy began with the assumption that God does not exist...Despite his protests, many have suggested that Camus’s position was not so far removed from Christianity as he supposed. The number of those who serve Christ is not confined to self-professed Christians. 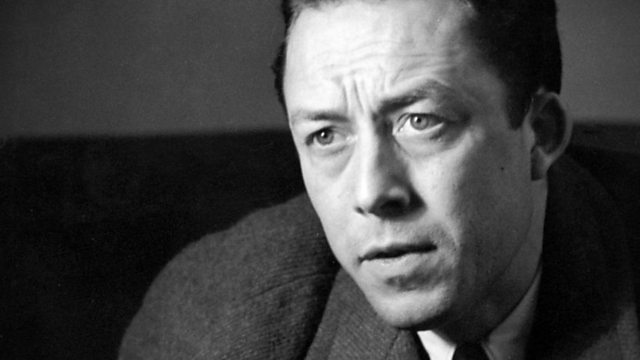 Paradoxically, Camus served the Truth by keeping faith with his conscience and denying God. Camus was a moralist who insisted that justice matters more than politics, that human need must confront “the unreasonable silence of the world,” as he wrote in The Myth of Sisyphus. Published in France in 1942, the book had a powerful appeal to readers living under the boot heel of the Nazi occupation, and marks a starting point, of sorts, in the evolution of Camus’s thinking on state-sponsored killing. French Resistance leaders took elaborate steps to make sure couriers and planners did not have all the information on major operations, lest they be captured and put to torture. Some committed suicide to avoid torture. Camus had grown up poor in Algiers, the capital of Algeria in North Africa, a French colonial department. Home was a small flat shared with a brother, austere grandmother, and his mother who was illiterate, nearly deaf and had withdrawn into a numbed silence after her husband’s death in World War I, when the boy was an infant. Camus carried a story from his mother of the father he never knew, witnessing a public execution before the war, going home, getting sick to the stomach. Camus grew up among French colonial settlers, Muslims and Arabs; thanks to scholarships and mentors, he received a classical French education and graduated from university in Algiers. After early newspaper work in Algiers, his writing became more focused in his twenties in France. In 1942 he published The Stranger, the novel that put him on the literary map. As he worked on Sisyphus he wrote editorials for Combat, a clandestine newspaper during the Resistance. A major turn in Camus’s journey toward the guillotine essay came in 1951 when he published The Rebel, which triggered one of the most spectacular literary battles in post-War Europe. The Nazi assault on European civilization had failed in the end; but Communism, for Camus, was just as morally blind. Marxist totalitarianism sacrificed justice as means to an end: the classless society. Camus' position drew the scorn of Jean-Paul Sartre, a committed Marxist, who published a long public letter attacking Camus himself as much as the book, throwing their friendship off the rails. But beneath the weight of ideology, Camus was struggling with meanings of justice. He was just as appalled by the French military policy of torturing Algerian captives. In our day, as the power of the state supersedes religion in Western democracies, many parts of America cleave to the essence of religious penalty—an eye for an eye. State-sponsored killing has expanded to extra-judicial killing by the White House, using drones to wipe out suspected terrorists in faraway spots on the map of Islam, with innocent people in the environs written off as collateral damage. What a confident group of male religious in that Dominican house, who invited Camus to address them in 1948. Excerpt online: http://meanderthal.typepad.com/meanderthal/2005/01/the_unbeliever_.html . "Well, I can say that, pessimistic as to human destiny, I am optimistic as to man. And not in the name of a humanism that always seemed to me to fall short, but in the name of an ignorance that tries to negate nothing." That is Camus speaking to the male religious in the article suggested by Thomas Hart OSB. This reminds me of the tone of The Stranger, where the story is whimsical as the convict awaits execution, but nobody seems to be worried that he shot an Arab on the beach because the sun got in his eyes. This is irony carried too far. And could you refuse to take sides on the question of France's withdrawal from its African colony? Even today the French government's actions require us to ask again about racism and law. If the people pass a racist law, does that make it just? If the highest court approves a racist policy, does that make it the law? Camus perhaps considered himself an Algerian, one of a million settlers. Let us look at this ignorantly: a million settlers arrive at your place under the protection of an invading army sent by a democratic country. They claim that you are now citizens of that invading country, free to vote (I assume all Algerians could vote in French elections, but, again, I doubt it). Is this a square deal? It seems, rather, to put racism in clearer terms. If you invade someone of a distinguishable ethnicity under the claim of giving them democratic rights, the challenge you must meet is that you should try this first on your fellow ethnic-group members to see how they like it. France should have corrected Germany's constitutional problems by invading Germany and sending settlers. No? Then it appears your invasion and settlement is a combined lynch mob and land-grab. And how does a democracy manage such an enormity? By degrading the quality of political conversation. By taking refuge in willful ignorance. Mr. Rushlau are you saying Camus was racist? Are you saying that he did not work for peace and reconciliation in Algeria? Not all people of European heritage in Algeria were the right-wing grand colons. Many were poor peasant stock from Spain, Sicily and Alsace. They had deep roots in the country going back to the mid 19th Century. It is naive to think they would just walk away (although they eventually did just that in 1962). How was Mr. Camus to feel while his entire family still lived in Algeria and the FLN was murdering and mutilating European civilians (not to mention many more "idigenous Algerians"). I am not saying that the French government and local authorities in Algeria were blameless. On the contrary, they created the violent terrorism of the FLN. Camus always said this. Equally as important though Camus never made excuses for the violent revolution of the FLN like some of his left-wing contemporaries did. This is what made Camus a moralist and a "secular saint". I found this article interesting and thought-provoking. However, when it comes to capital punishment, or any sanctioned killing by authority, religious or secular, its morality is time and culturally contingent. All one has to do is read the Old and New Testament. For centuries, killing for adultery was morally just, and cutting off limbs for certain crimes was morally permissible. If you believe in Catholic exegeses, God killed Onan because he was practicing coitus interrupts. Of course, anything that God did was just. Even Thomas Aquinas, whose ethics underpin many Catholic Church teachings, believed that killing a man to safe-guard justice was morally permitted at least if State Authority carried it out. However, killing a man for vengeance was immoral. If you think hard about these case examples, it contradicts the Catholic moral principle "the end does not justify the means" because in these cases the end/goal indeed justifies the means. Both the Church and secular society has learned to be more tolerant over the centuries. At least this is true in a limited way and not a universal. However, I do agree that capital punishment should only be reserved for extreme cases of horrific crimes where there is no reasonable hope for rehabilitation. I do believe that life in prison without parole is hell on earth and should be preferred over a death sentence. One final thought. There are many moral dilemmas that the Catholic Church offers no rational convincing "moral" answers. Consider the case where you are sitting on a plane that was highjacked by terrorists and it is heading to NYC with a dirty bomb that will kill a million people. The plane has 200 people on board, and you have the opportunity of blowing up the plane over the ocean far from NYC and avoiding this tragedy. Is it morally permissible to do that? An outstanding article and my thanks also to Thomas Hart for the link to the talk given by Camus to the Dominicans. The final paragraph alone is worth reading.